Introducing the Lamy Safari Petrol Pen Collection! Lamy has introduced its 2017 limited edition color for its extremely popular Lamy Safari pen collection, the Lamy Safari Petrol. Combined with the new 2017 Lamy Al-Star Pacific Blue pen collection, which is available for sale today at Pen Chalet, Lamy continues updating its blue line of pens for 2017 with the Petrol color. 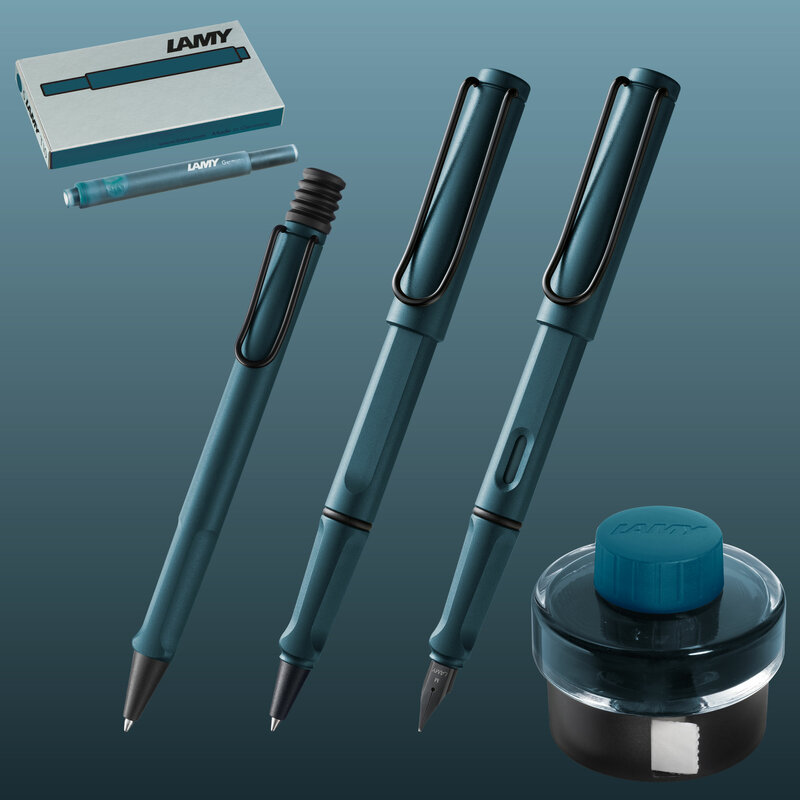 The Lamy Safari Petrol is a conglomeration of colors, which can be labeled as a combination of blue, grey, green, but is labeled as Dark Teal. Even after the exceptional popularity of 2016’s Lamy Safari Dark Lilac collection, we fully expect 2017’s Lamy Petrol collection to match if not exceed Dark Lilac in popularity. Petrol is a deep, dark blue green color that is unlike anything really on the market today. The Lamy Safari Petrol pen comes with a black clip and black nib (for the fountain pen), which combined with the dark teal color really is impressive. Lamy Safari pens are well known and instantly recognizable the world over for its unique shape, distinctive clip and ergonomic grip section. Combined with the reasonable price and super German manufactured nib makes the Lamy Safari one of the most loved collections in the fine writing community. The Lamy Safari pen collection is made of ABS plastic for its barrel and cap section and is available in a fountain pen, rollerball pen and “click” ballpoint pen options. As with all its limited edition Safari and Al-Star collections, Lamy has also introduced a matching Petrol ink color for this 2017 addition to the Safari family, available in both a Lamy Petrol 50 ml. bottle ink and a Lamy Petrol cartridge 5 pack. We expect this pen to move quickly, when it’s released in April of 2017, however, you can pre-order your new Lamy Safari Petrol pen today at Pen Chalet and get one from our first shipment when we receive them. We fully expect this collection to sell out, as we think the new Lamy Safari Petrol color is fantastically unique. 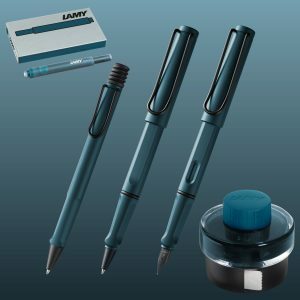 The Lamy Safari Petrol collection retails as follows: The Lamy Petrol fountain pen costs $37.00, and comes in a medium, fine and extra fine black nibs. The Lamy Petrol rollerball pen costs $32.00 and the Lamy Petrol ballpoint pen costs $27.00, with the inks costing $10.50 and $4.50 respectively for the bottle and cartridge versions. Pen Chalet offers a daily discount on all its Lamy products for 20% off full retail prices. One of the best things about the Lamy Safari and Al-Star pens is that you can easily nib swap your Lamy Safari pen with a stainless steel nib in any size including broad, and 1.1, 1.5 or 1.9 italic nibs. As a reminder, the Lamy Safari collection does come with one cartridge, but no converter, so be sure to pick up a Lamy LZ24 converter that fits the Lamy Safari collection with your order so that you can use your favorite bottled ink with your new pen. Lastly, if you have not seen the new 2017 Lamy Al-Star Pacific Blue collection, which has an anodized aluminum body instead of plastic, please check out that pen as well. This entry was posted in Ballpoint Pens, Fountain Pen Ink, Fountain Pens, Rollerball Pens and tagged ballpoint pen, fountain pen, fountain pen ink, Lamy, new, rollerball pen, special edition on February 6, 2017 by Pen Chalet.